This entry was posted in early summer, garden design, meadow garden, native plants and tagged garden, gardening for wildlife, meadow, native plants. You have black-eyed Susans blooming in June? We do not. The butterfly weed is blooming, though. I am wondering if you could get Deptford pinks established in there. The black eyed Susans just came on in the last week or so and are filling in as the oxeye daisies and butterfly weed go over. I guess we are a bit earlier! I just looked up deptford pinks and I think a few of them are already in another part if the garden… they sort of let themselves in. I will definitely have to remember to send a few seed heads into the meadow and see if they like it there as well! Actually I was also considering phlox subulata. I’ve seen it naturalized in a few spots, and maybe it could survive the meadow competition. I like your meadow, the daisies look great. One great thing about the meadow is its low low maintenance. It’s the perfect garden to observe with a cool drink from the hammock! People who complain about a lack of industry can be scolded for having no regards for the value of pollinators. After seeing your potager post I highly doubt that your garden is as out of control as you claim. A few stray dead heads do not make you an old lady, and although your house may be old it’s decidedly un-shoelike! -still it is nice to dream of that perfectly tended weed free garden. ‘The Old Lady Who Lived in a Shoe’ is a childrens’ nursery rhyme and like her I have so many children I don’ t know what to do. All those thirsty plants in desperate need of attention. The hammock is the best idea, we are not used to this sort of heat here. It’s just not English. Never once did I doubt you had too many children! The collections of pots I’ve seen in some of your posts look as if they’d be plenty of work to keep watered, I hate to think of the watering the rest of the garden. Your old shoe looks as if it might have some nice thick walls and plenty of cool corners to hide in. Hopefully the best will pass soon enough! I won’t mention the weather conditions here or what came down again. I haven’t watered in several weeks and I’m quite happy about that! Meadows take time to look really good, give it a couple more years! I’m sure the bees and butterflies think it is just fantastic as it is now, if they like it then it must be ok! I am more than prepared to wait patiently for a few more years! I’m not sure if the meadows here take on the same look as English meadows, they’re usually either a prairie planting or short lived plants which hold the ground until trees take over. But I’m going to hang in there. Even a grassy hayfield look would be nicer than even more square footage of tedious lawn. I did manage to drag her out and choose a few annuals together, that was a first, so I guess anything’s possible! Maybe as the more colorful flowers thicken up and put on a stronger display opinions will change. We’ll see! Looks great, but you don’t need a succession forest. Hope there is a good compromise. Agreed. I like woodland gardens but the buzzing activity of the meadow is far more interesting in my opinion. I like the meadow. Despite being weeds, one of the easiest tricks to make it look more ‘cultivated’ is to simply choose another plant from the same family member to the weeds that are thriving. For instance I had lot of broom seedlings (a weed in the pea family) come up in a big patch of the garden so I planted lupins there and these have done exceptionally well. That’s a great suggestion. I’m going to have to give it some thought. Right now the one plant which seems to be doing exceptionally well is the little bluestem grass. I’m not sure if I want a late summer peak to the meadow, I prefer the summer flowers, but for now the bluestem doesn’t seem to mind a late summer mowing. That sounds like a plan! I should have plenty of spare seed from the front garden and it’s just a matter if seeing which if those can survive a midsummer mowing. I’ll have to look and see what else might be able to survive back there! I can see how a non-gardener could be a bit apathetic over a meadow. Even clients that have them installed, after a few years of the meadow reverting, are ready to go back to grass. Not many realize meadows need work to keep them full of flowers each year. I like sparsely flowered meadows filled with grasses, but those pesky big-leafed weeds are can be a pain. 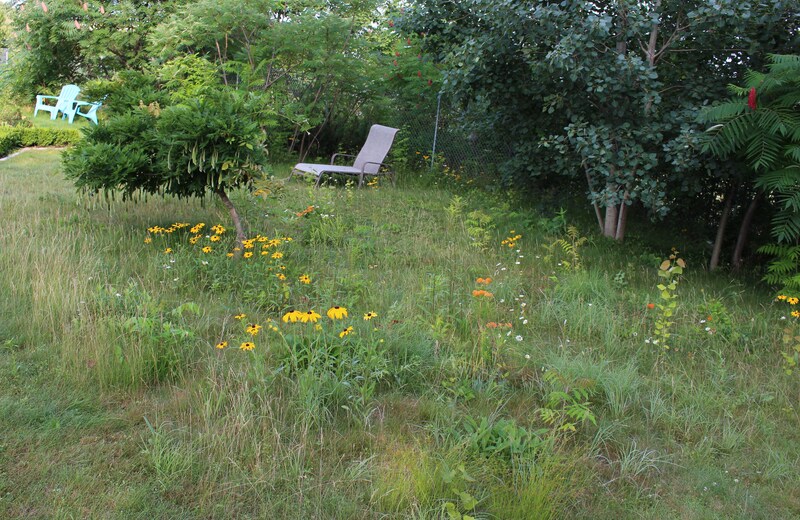 I always wanted a meadow but I don’t have enough room for one so my entire yard became somewhat of a disorganized mess and I’m sure I have neighbors who are less than happy with me. But the birds like it. And I think we are going to put a path through it which will better organize the spaces around the trees, etc. My Black-Eyed Susans came out in full force this week too. A mess isn’t necessarily a bad thing but there should be some kind of structure to avoid the ‘abandoned property’ look. Many of the parts of my garden come close to that…. of course I avoid posting those pictures! I think a path through would be an excellent way to organize. 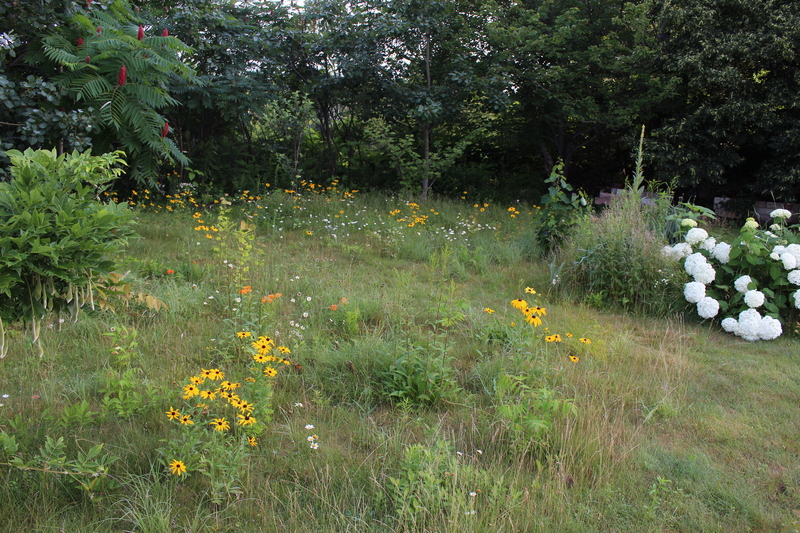 When I mow a path through the meadow it suddenly becomes a garden rather than the weedy fringe of the back yard. It really makes a difference. Still I would far rather a ‘too wild’ garden next door than a dull, sunburnt patch of lifeless turf any day. 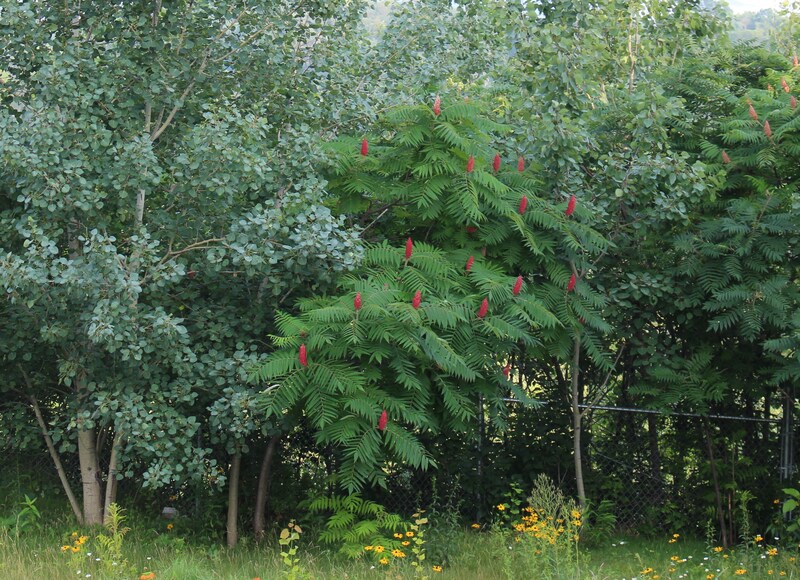 I planted a Rhus one year. The next year I had twelve. Good luck..
heh heh. I have at least twelve Rhus this year. Some are very cute and tiny right now, I wonder when my opinion will change! I didon’t know aspens grew this far east. Perhaps cottonwood? Ugh, you’ve seen right through my shoddy research! I’m 80% sure it’s aspen but there are cottonwood nearby (based on the drifts of fluff which float through the neighborhood each spring) so even though my trees don’t put out the fluff, there’s a possibility they’re just male clones. Still I did do a little rough research and was surprised to find that aspen ranges throughout the northern parts of NA and I’m far enough up to be in the range, so it’s a possibility. I do have a couple bigtooth aspen growing alongside, so I guess it is potential aspen territory, but I think it’s time I went out there and did a definite ID! You shouldn’t feel guilty about a low maintenance area of the garden, there is always such a lot to do. I’ve returned to a heatwave even by Italian standards and it is too hot to do anything after about 9 in the morning! Sorry that you’re having such a heat wave. We’ve been bathing in hot humidity here so it’s also not the most pleasant gardening weather… good for sunflowers though, and I see yours are doing well!